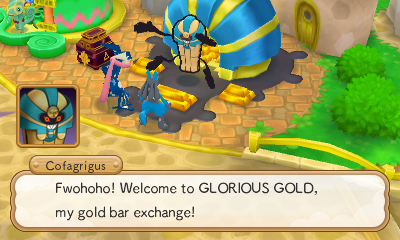 GLORIOUS GOLD is a shop in Lively Town and Pelipper Island where gold bars can be exchanged for a variety of things. Gold bars can be exchanged for 555 Poké ( ) each. Gold bars can be exchanged for a variety of items. After completing the main story, gold bars can be exchanged for high quality looplets, most of which can hold 5 or more emeras. In addition, items from the treasure collection can be purchased after finding them in dungeons if they are lost.